-- An angel has told Gideon he will free God's people from the Midianites. But, with no army and facing outrageous odds, Gideon finds it hard to believe and even harder to act on faith. Watch as God gives Gideon just what he needs to strengthen his faith. 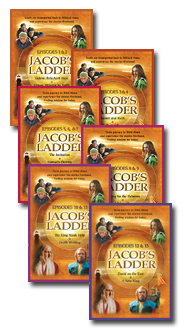 In the process, Gideon learns to depend on God to do the impossible. Saul Episode 8: A King for the Hebrews -- Samuel has been a faithful prophet and judge of Israel for many years, but the people are increasingly dissatisfied. Attacks from surrounding nations have fed their desire for a king to lead them. Will the fledgling nation ever learn to trust in God alone and thank him for all He's given them? Saul And David Episode 10: The King Needs Help -- King Saul has serious bouts of depression and David, a shepherd boy, is invited to come and play his lute for the king. Unbeknown to the king, David has been anointed by Samuel to be the next king of the Hebrews. The Casluhite army prepares for yet another attack, but a battle is avoided by having two champions fight on behalf of the two sides. Goliath, the Casluhite champion, is so overpowering that no Hebrew can be found to fight him. When David visits his brothers on the battlefield, he offers to fight Goliath. David kills the giant and is taken to the king's palace. The royal princes and princesses are all very impressed with David, but secretly, King Saul is jealous of the young champion. In a moment of madness, Saul might kill the boy who's just saved the country. David Episode 12: David on the Run -- King Saul wants David dead but has failed to get him killed on the battlefield. In his madness, Saul throws a spear at David while he plays the lute for the king. David runs for his life and finds refuge with Samuel the prophet.